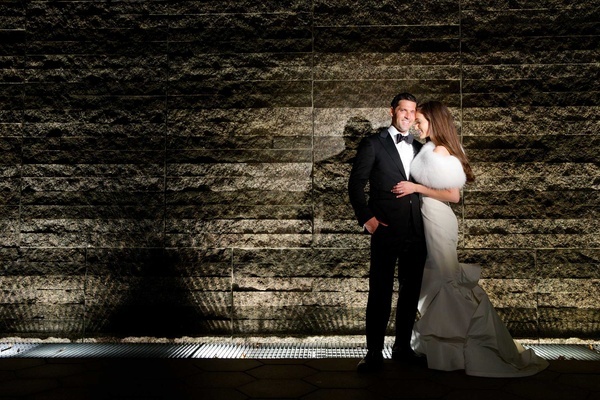 If you’ve managed to capture your engagement on film, you’re a couple who’s truly blessed; if your engagement is also broadcast on Bravo original programming, you’re lifestyle host Jennifer Stone and real estate powerhouse Chad Carroll. 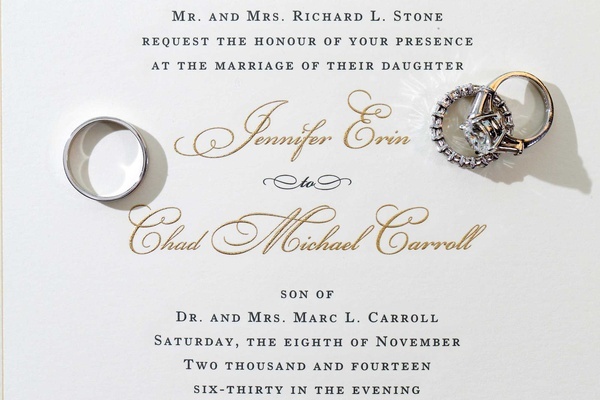 “The proposal happened while we were filming for Chad’s show, Million Dollar Listing Miami,” shares Jen. 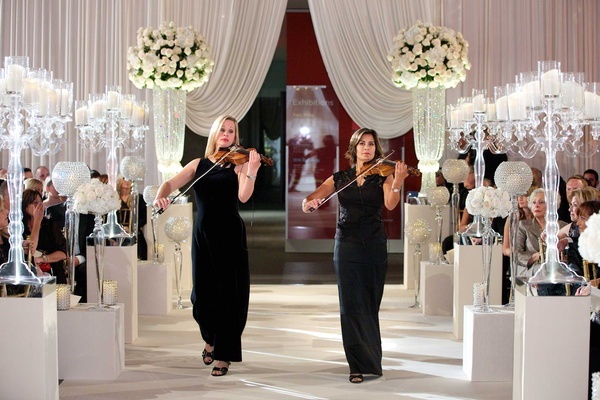 “We had a romantic evening planned for the shoot, and knowing that the show is completely professional and based on real estate, I thought it was going to be just that!” Delightfully surprised, Jen said yes, thus the engagement was enjoyed by thousands of viewers. 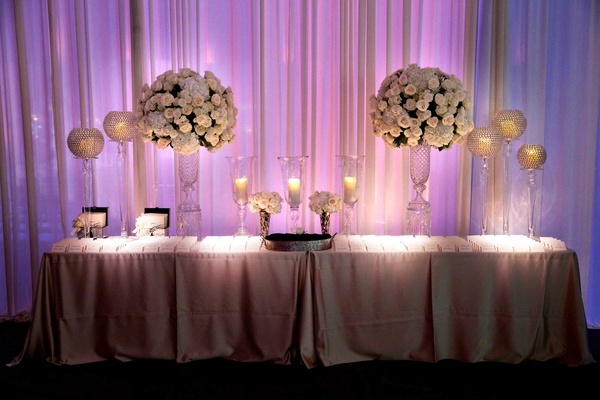 Although dividing the area was a practical move, the look was intrinsically ethereal. 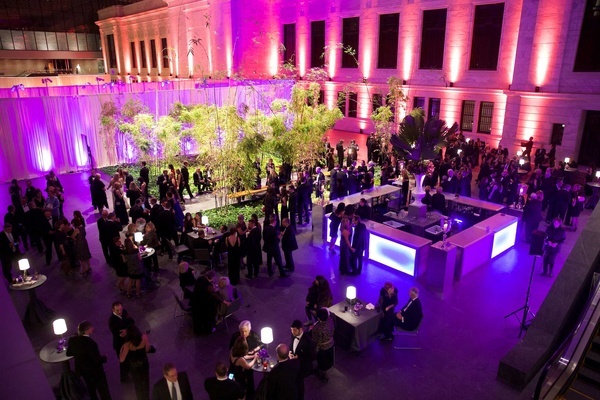 “We transformed a large, open atrium into intimate settings by constructing flowing, draped dividers to designate each section of the evening: nuptials, cocktails, and the reception,” explains Jen. 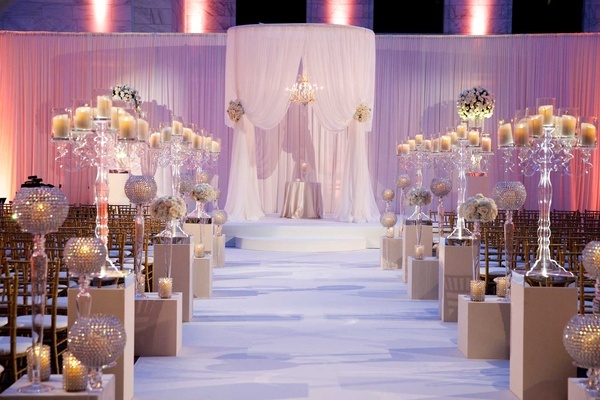 The ceremony space was a vision of ivory and white. 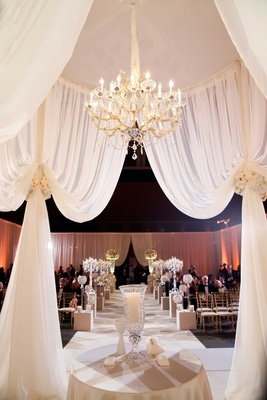 Sinuous chiffon fabric with floral tiebacks set the stage for the vow exchange, which took place on a raised platform beneath a crystal-and-gold chandelier. 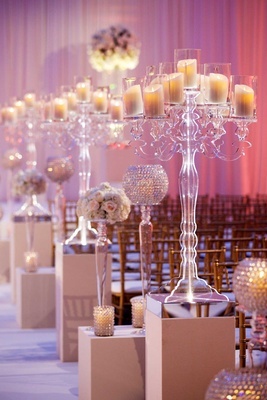 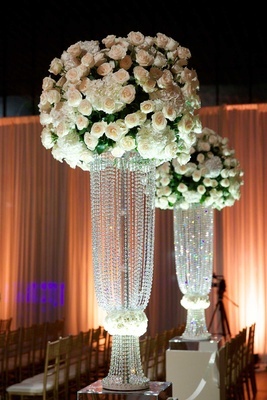 Gleaming candelabra and Swarovski-crystal votives glowed softly with candlelight alongside standing displays of creamy flowers that ran the length of the aisle. 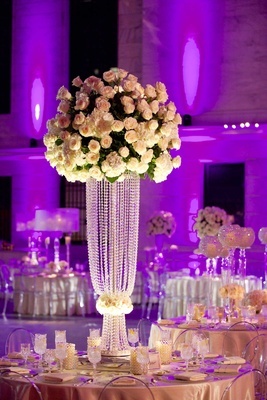 Alabaster foundations added height to the décor, including two towering arrangements of roses that stood sentry over the entrance. 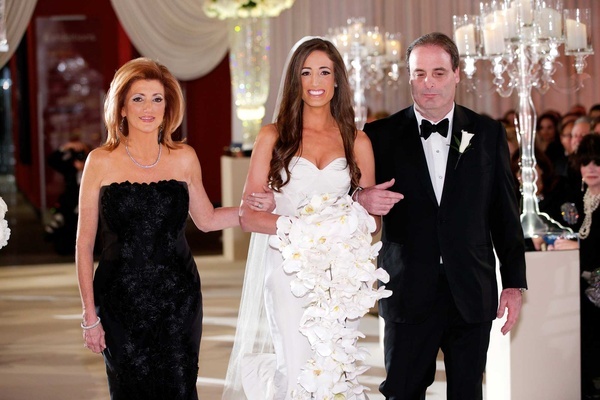 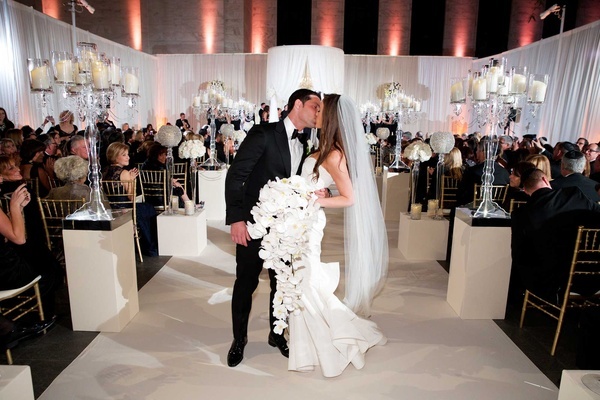 Radiant in a strapless Oscar de la Renta gown and a chapel-length veil, the bride held a spectacular bouquet of cascading phalaenopsis orchids. 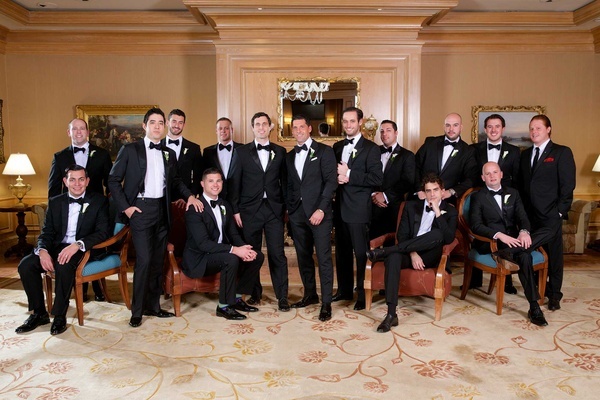 Bridesmaids dressed in black carried nosegays of vanilla roses, while the tuxedo-clad groom and his groomsmen wore mini calla lilies as boutonnieres. 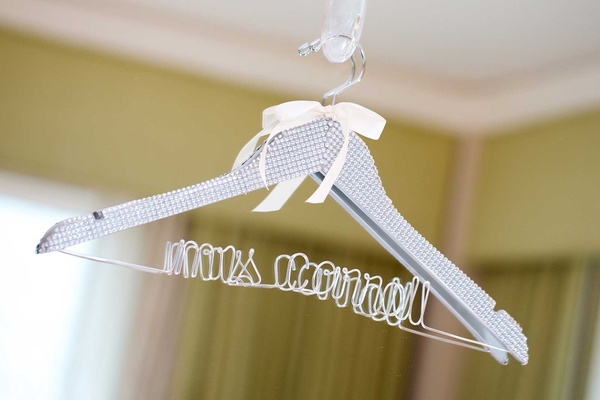 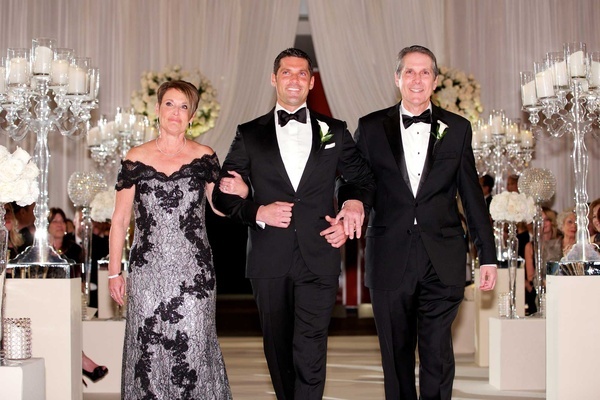 The service was followed by an unexpected twist: “After an elegant ceremony, we surprised our guests – and the groom! 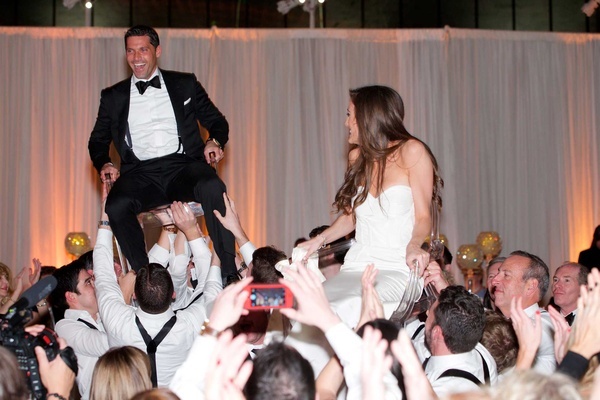 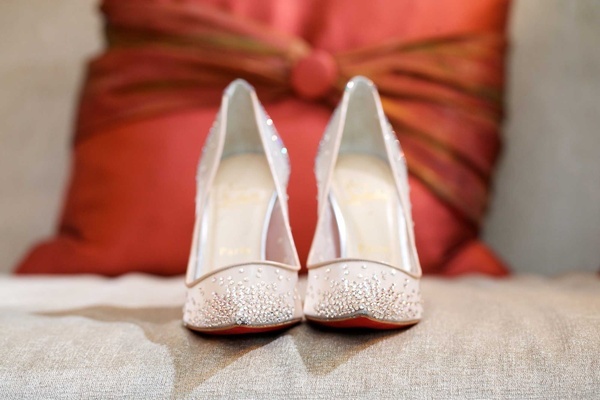 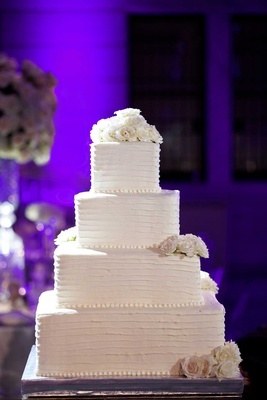 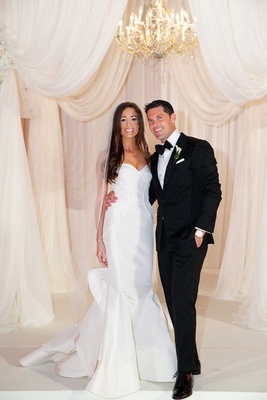 – with a Miami-inspired cocktail hour featuring dramatic lighting and Latin club music,” shares the bride. 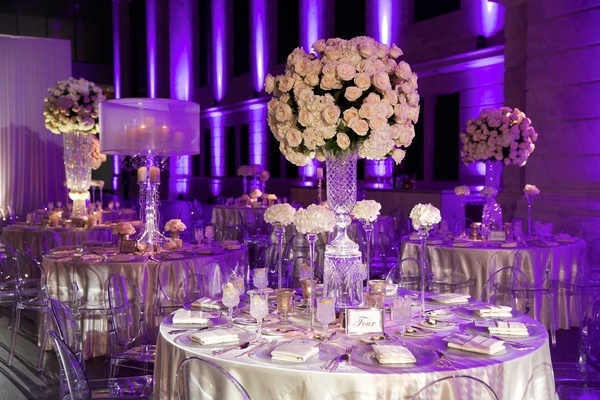 An enormous square bar radiated violet light from within and featured a floral focal point of palm fronds and purple orchids. 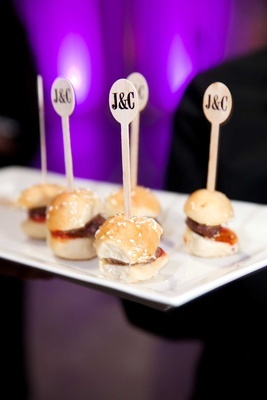 Hors d’oeuvres were embellished with custom “J&C” picks, and mini fish tacos were paired with shots of Patrón Tequila to “help bring out the Latin, Miami feel,” adds Jen. 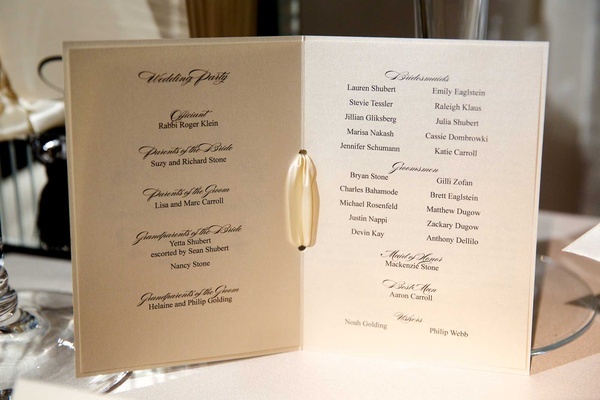 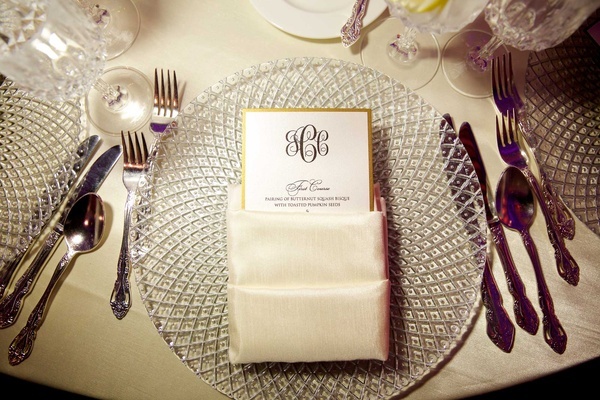 The formal reception was a study in classic elegance. 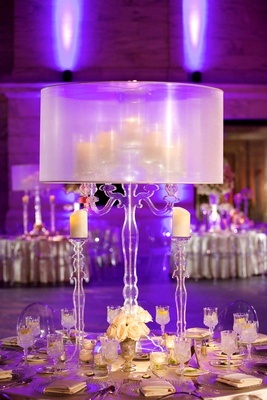 Tables were draped in silk linens in a crème brûlée shade and set with cut-crystal stemware and clear-crystal charger plates. 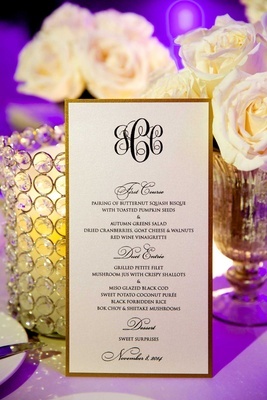 Menu cards monogrammed in chic gold and black were tucked into napkins placed on each setting, and an array of glass and crystal vessels held copious amounts of flowers and candles. 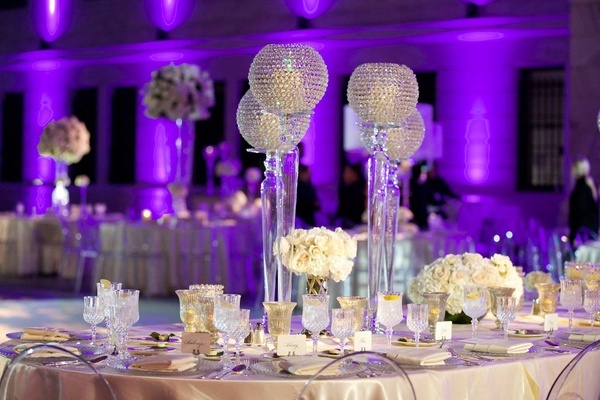 The celebration continued into the early morning hours with an after-party held at a grand Cleveland hotel. 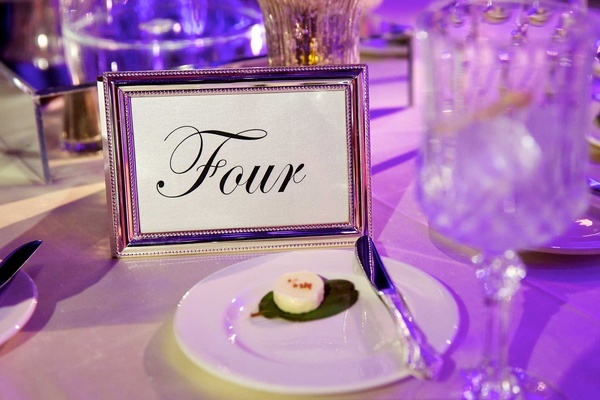 Guests enjoyed local delicacies and took home sweets from a milk-and-cookies bar. 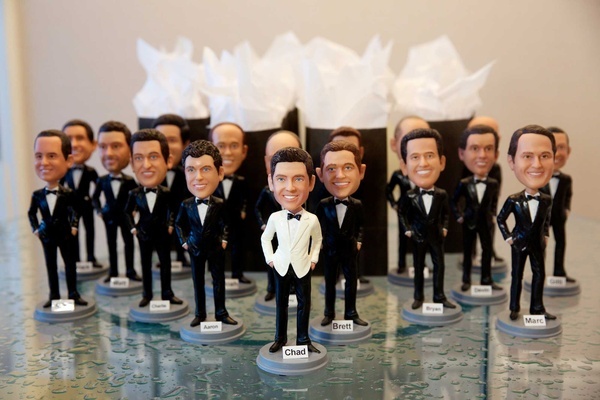 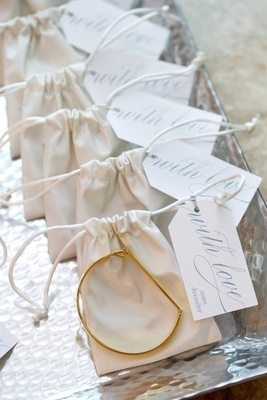 Bridesmaids added gifts of personalized bracelets to the satin robes they’d previously received, and groomsmen were presented with custom bobbleheads.